just-iced cookies: Look WHOOO turned 1!! My little nephew, Henry, turned 1 this month! No Photoshop - she handmade EACH one (cutting out everything with scissors, then doing that spongy stuff around the edges! glueing, bradding...)- and I can't remember how many she made, but she's the youngest of 6 and her hubby's the 11th of 12 - so needless to say, she cranked out A LOT of those adorable OWL invitations. 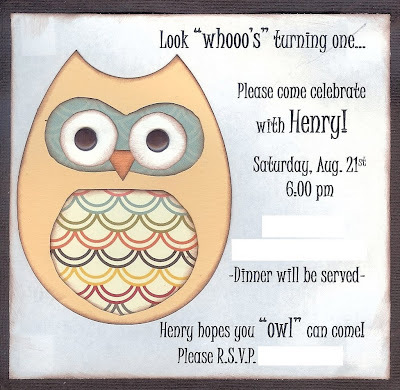 and I tried to duplicate the owl on the invitation - using an egg shaped cookie cutter and a circle fondant cutter to cut out the ears on top of the head. Sadly we couldn't make the trip to attend - *sniff*, but I was so glad I was able to still help out with a small part of the party. Happy 1st Birthday to you, Henry - that's WHO!! oh my goodness. ADORABLE!!!!! Those cupcakes are such a great idea too! You did an amazing job with the owl cookies. They were a hit. Megs is pretty amazing too! ps. what kind an amazing woman takes cookies like that to a neighborhood party? YOU really are the best!